I want to disclose ahead of time that I am not a doctor or a medical professional. At the time of writing this, I am however exactly 24 weeks pregnant with a baby boy. That means I can share with you what’s working for me, but it doesn’t mean I have all the right answers for you. Every body and every pregnancy is unique. If you’re pregnant and debating on whether or not to do the 21 Day Fix program, the first thing you need to do is check with your doctor. That’s because unless you were following the program safely before finding out the big news, in which case you would still chat with your doctor and be given the okay to continue on with it using obvious discretion with your changing body, you will want to ease into any new exercise regimen. As long as your doctor has given you the green light, exercise is great during pregnancy. It helps you stay in optimum shape for the mighty task of giving birth, prevents gaining too much weight, reduces the risk of preeclampsia and gestational diabetes, as well as helps you be more likely to spring back into shape after your new bundle of joy arrives. In the rest of this post, I’ll be covering the adjustments I made at the suggestion of my obstetrician. Be sure to use your own common sense that you may want to take into account when following the 21 Day Fix workouts and the diet. I would suggest taking some mental or physical notes from this post and bringing them to the attention of your obstetrician at your next check-up. 21 Day Fix at 24 weeks pregnant. When we went to visit the OB for the first time, one of my few initial questions I asked was whether or not I could exercise. The short answer was yes, however, you do have to use caution because your body is going through HUGE changes right now. As long as you’ve been working out, you can safely continue to work out at a similar intensity, and if you haven’t been working out, you need to start an easy exercise program as soon as you can. This is where the 21 Day Fix is great, because it is very easy to tone down to your fitness level and start building the strength you’ll need come third trimester time. Beginner Tip: Follow the modifier, do the moves more slowly than they’re doing them, walk it out when your heart rate is climbing too high or you can’t talk in a complete sentence without gasping for air, and be aware of positions that cause you any sort of discomfort. Don’t Twist Your Midsection: While you can safely stretch to the sides slowly (I do this during my prenatal yoga workouts), you do not want to do anything that will pull your already compromised abdominal muscles. Use Proper Form: If you start flailing your body about, you will be that much more likely to injure yourself. Stay controlled. Use the Correct Amount of Weight: I think this is pretty self-explanatory. If you’re a true beginner, start with no weight. Be Aware of Your Current Fitness Level: Follow the workout without weights until you’re used to the moves to figure out what will work for you and what won’t. And if you’re as exhausted as I was during the first trimester or extremely nauseous, take it easy and do the best you can. If you can only get in 20 minutes, that is 100% okay. Be Aware of Your Body: Pay attention to what moves are uncomfortable for you and stop immediately. It is also way easier to overstretch your muscles as your hormones relax them. Watch Your Balance: As your belly grows, your center of gravity is thrown way off, which leads us to not being as steady on our feet to begin with, so we need to exercise extreme caution. This will also be times when we get lightheaded during certain periods of pregnancy, so be careful. Don’t Do Any Exercises Lying on Your Back After the First Trimester: As you probably already know, lying on your back can put unnecessary pressure on the vena cava, which you just do not want to mess with. 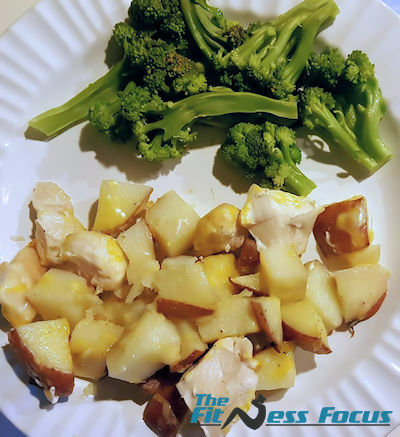 Balanced 21 Day Fix Approved Dinner – chicken & potato bake topped with cheddar cheese with a side of broccoli. You will need to adjust the 21 Day Fix diet to fit your calorie and nutrient needs during pregnancy. First, you should figure out your daily calorie needs to maintain your current weight with the program. You must NEVER try to lose weight during pregnancy – EVER!!! The next thing: EAT CLEAN!!! The food you eat is one of the best ways to ensure your baby is getting the nutrients they need and a way for you to feel a whole lot better during pregnancy and reduce the chances of the bad pregnancy side effects. And while the 21 Day Fix is a great way to learn to eat healthy, you will have to add in some extra colors to your day. Carbohydrates: Stick to whole grain carbs and aim for 5-6 servings each day. I know if I eat any less than that, I get constipated. Protein: Experts recommend 75 to 100 grams of protein per day. This means 2-3 servings of lean meat or legumes. Fat: Shoot for healthy unsaturated fats in moderation. Aim for 4 servings of fat each day if you’re consuming a 2000 calorie diet. Calcium: The daily requirement of calcium is about 1000 milligrams or 3-4 servings of dairy. Vitamin C: Experts recommend at least 85 milligrams per day, which is equivalent to 3-4 servings of fruit or veggies. Iron: A daily intake of 27 milligrams is ideal during pregnancy. 2-3 servings of leafy greens, 3 servings of whole grain carbs, or 2-3 servings of lean protein. Remember that just because there are two of you now, you’re not eating for two! And even if you’re feeling ravenous like I did from week 11 on, make sure to track your calories and nutrients. I use the myfitnesspal app a few days a week to ensure I’m staying within a healthy calorie range to gain the recommended 25-35lbs during pregnancy. During your first trimester, do not add extra calories to your diet unless you just started a new exercise program in which case you will want to add in what deficit you’ve creating with your workout. During your second and third trimesters, the American Pregnancy Association recommends upping your daily intake by 300 calories. Don’t expect miracles if you were envisioning a giant Cheesecake Factory slice of cheesecake. Think more along the lines of two glasses of skim milk and a bowl of oatmeal. And if you’re carrying more than one little miracle? Add an extra 300 calories each day for each extra baby. Each trimester, you’re going to be faced with new and sometimes additional obstacles that you will want to be aware of when you’re following the 21 Day Fix. During the first trimester, I was hit hard with fatigue. Every now and then if I didn’t eat often enough or if I overate slightly, I would feel mega nauseous, but I know some women are plagued by unbearable nausea for the entire first trimester and beyond. Exercise was tough, but I knew it was something I had to make myself do, and it always ended up boosting my energy for a short time. Your balance can be slightly off or you may feel lightheaded if you are hanging over and lift your body up too quickly with all the hormones raging through your body, so use your intuition. I limited the use of weights during workouts during my first trimester, and if I did use weights, they were light ones. I had to find out how my body handled the working out while trying to do the gargantuan task of building a tiny human being. During your second trimester, you will feel your energy levels sore as your hormones start leveling out. They call this the honeymoon phase for a reason. Your center of balance is going to start getting thrown off as your bump gets bigger, and you’ll start feeling more pulling in your abdomen if you haven’t already experienced it. I know I still have been careful about leaning over for things, because I get dragged down sometimes, and when I jump around during cardio, I sometimes have to grab my lower abdomen where he is residing right now. Hello, belly band!!! I am super careful about any activities that engage my abdominal exercises and have been throughout pregnancy. Instead of any type of crunch, think of doing alternative ab exercises such as planks, cat/cow poses, side planks, etc. And definitely modify when you have to! Your body is in a very precious state right now, and you want to honor that. During your third trimester, fatigue sets in again as the baby starts gaining weight fast and the final stages of fetal development take place, putting extra stress on you and your joints. I haven’t experienced this trimester yet, but depending on how in shape you are during the rest of your pregnancy, you can likely still keep up with the 21 Day Fix. Just be aware of your growing belly, don’t lie on your back during any exercises, and listen to your body. If not using weights feels like the right thing to do, then don’t. Autumn’s pregnancy specific routine – Active Maternity is a Beachbody On Demand exclusive program. An alternative to the 21 Day Fix, then you will be pleased to know Autumn has her own Active Maternity workout program. This three-workout program is only available through Beachbody On Demand, which is part of the Team Beachbody Club membership(link to unlimkited14-day trial). These workouts are no joke either! 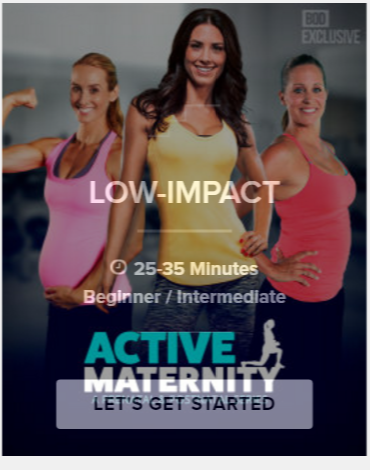 The major difference here is that in the Active Maternity workout program, the moves are designed specifically with a pregnant woman’s changing body in mind. While the 21 Day Fix can be great for us pregnant ladies, you will have to modify moves. With Active Maternity, you may need to modify moves if they’re going a little too fast, but all moves keep your growing belly in mind as compared to the 21 Day Fix which doesn’t. What about the 21 Day Fix Extreme? Again, this all has to do with your current level of activity. If you haven’t been exercising regularly, then I would suggest following Active Maternity or the 21 Day Fix. But if you’re in extremely good physical condition, work out daily, and are ready to take on something new, try it out and see how you feel. Just be aware of the modifications you will need to make and check with your physician beforehand before beginning this or any workout. While I can’t say there is a best Beachbody workout program, I hope this post gave you a good look at a few of the options that are available to you while pregnant. Have a safe, healthy and active pregnancy! Your body, and baby, will thank you later. I am currently a nursing mother of a 3 month old baby girl! Do I add calories for nursing? I don’t want my milk supply to drop at all. I have had a hard time with my milk supply already I don’t want to do anything to throw it off. I am 5 weeks pregnant and I do not want to loose weight under no circumstances! If I used to consume 1200 calories ad day, do I add now 700 calories to my diet since I am pregnant? 400 Calories for maintaining the weight and 300 calories for the baby? This will put me into the third column, is this correct? Congratulations!!!! This is exactly what you would want to do to accommodate your growing baby – great job! Basically, your base maintenance calorie amount should equal however many calories you were eating before pregnancy, and then you’d add the extra 300 calories. And to be safe, always make sure to check with your OB! Happy pregnancy! Hi! Just curious as to what you do during ab moves? Hello! Congrats on your pregnancy! I started 21DF of Monday. Currently 4 days in I have lost 1.7 pounds. I have trouble with eating all my containers. I will eat all my protein and 1 card and maybe 1 fruit and 2 vegs or 2 fruit and 1 veg. I am consistent with my workouts which I’m very happy about! :) How would you plan this. I have the food available but I just don’t get hungry and I don’t want to eat. Should I perhaps follow a meal guide of 21DF on pintrest? So you think maybe I should cut a container of everything? Four servings of fats? That seems like so much compared to 21 df. Does this mean I would eat four blue containers? I am pregnant and trying to maintain a healthy diet, so I was trying to follow the 21df diet but on the higher calorie plan to gain wait.